Here are little known facts about restaurants, from street vendors in Ancient Rome to modern day fast food chains. Do you know where the largest restaurant is located? Or how about the oldest restaurant in the world? 1. Restaurants Have Been Around Forever. Well, almost forever. The concept of selling food for profit goes back to ancient civilizations, including ancient Rome and China, where street vendors sold bread and wine to people in cities. Fast forward several centuries to the Middle Ages and the roadside inn is the earliest form of our modern day sit-down restaurant. Of course, the menu choices were strictly chef’s choice and patrons had no choice but to dine family style. .
2. The French Revolution Invented Fine Dining. After Louis XVI and Marie Antoinette lost their heads during the French Revolution, the French aristocracy crumbled and chefs, once employed by noble households, found themselves out of a job. So many of these displaced workers decided to open up their own establishments and offer prix fixe meals to the masses. Eventually the French style of dining out spread to Great Britain and across the Atlantic to the United States. .
3. The World’s largest restaurant is in Syria. Bawabet Dimashq Restaurant, which translates to Damascus Gate Restaurant, has 6,014 seats and is located in Damascus, Syria. 4. The Oldest Restaurant in the United States is in Boston. The Union Oyster House has been serving up fresh oysters and more since 1826. 5. Restaurant is a French Term. Restaurant was once used to describe the rich bouillons served at taverns and public houses in France, to restore the spirits and relieve ailments. 6. The World’s Oldest Restaurant is in Spain. According to the Guinness Book of World Records Botin Restaurant in Madrid, Spain is the world’s oldest operating restaurant, which has been in business since 1725. 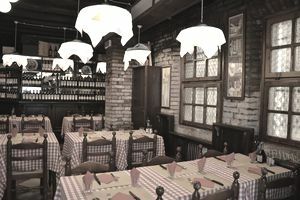 However, there are other restaurants that claim to be older than Botin, including Stiftskeller St. Peter in Salzburg, Austria, open since 803 and Zum Franziskaner in Stockholm, Sweden, open since 1421. 7. McDonalds Once Featured a Grilled Pineapple Sandwich. Even McDonalds, , has had its fair share of menu flops. In the 1960s, McDonald’s CEO Ray Kroc ran a pineapple “hula burger” during lent, in select areas with a high catholic population. The sandwich featured a sesame seed bun, and grilled pineapple ring topped with a slice of American cheese. Understandably, the Hula Burger didn’t last long, never making it nationally. 8. Starbucks is a Chain but not a Franchise. All franchises are chain restaurants, but not all chains are franchises. Case in point, Starbucks. Starbucks is one of the biggest chains in the entire world. But, unlike McDonalds, which is the largest chain in the world, Starbucks is owned by the same company, not a group of Franchisees. .
9. The World’s Most Expensive Burger Costs $5000. There are plenty of expensive burgers out there. The 666 Food Truck in New York City offers a burger with truffles, foie gras and Himalayan salt for $666. Paris, Las Vegas offers a $777 Kobe beef burger, which contains a Maine lobster, caramelized onions, imported Brie cheese, crispy prosciutto, 100-year aged Balsamic vinegar. But the most expensive burger? It goes to Fleur de Lys at Mandalay Bay, Las Vegas, which offers an astounding $5000 burger. 10. The Average American Spends $2505 Eating Out. According to the USDA, Americans spend just over $2500 eating away from home. A bonus, Americans drop $8 billion (yes, billion) on dining on just Valentine’s Day. How much of it is at your restaurant?